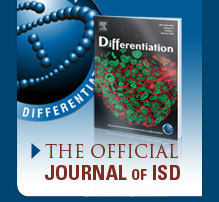 Online subscriptions to Differentiation are included with ISD membership and can be accessed at www.sciencedirect.com/diff as soon as you have obtained an Elsevier username and password. Please find below instructions for setting up online access to Differentiation on Elsevier. Please follow these instructions carefully. Enter your Society Membership Number and click on submit. Both username and password are case sensitive. After registration you can directly login with your new username and password. The above URL is a secure site, to ensure that your details are securely entered in Elsevier’s Customer Service System. Do NOT use special characters, such as ö, ä, æ when entering your personal details into the profile form. Cookies must be enabled in your browser to support the registration process. If you encounter any problems registering, note that older browsers may not support SSL encryption, which is required for secure data transmission. Enter your personal username and password in the login bar on the top of the page.